The peak of our market was April 2008. Back then, 5 year fixed mortgage rates were approaching 6%. It was also a time when everyone believed the escalating price party was a permanent part of the local real estate market. no one saw it coming--well almost no one anyway (H/T to all you regular readers here). Sure there were warning signs. But Victoria was insulated. Sure prices were high. But wealthy boomers were coming. Sure the length of the run up and the newfangled mortgage products encouraged FTBers to buy sooner than ever, robbing the market of new entrants years in advance. But buying still made more sense than renting. And then all of a sudden it didn't. Prices dropped 15% in 9 months. All the while industry told us they couldn't. And when they did, industry told us they wouldn't last at that price long. And then the recession hit Canada, but industry told us Victoria was insulated, that this was a once in a lifetime opportunity that only fools would choose to miss. Ontario's pain, it would be told, creates a magical, even mystical, opportunity for buyers to take advantage of plummeting interest rates and reduced prices to finally own that home they'd been craving for so long. And oh! how Victorians did buy. January 2009 was the worst month that anyone could remember for sales in the city. But February, sweet February, how the buyers did return to the triumphant ringing of real estate church bells. And then March, gracious March, your gift of stable prices led to the realization that this time it truly is different. This time, by your grace, prices would not fall off the Cliffs of Insanity to crash hard at the soft, sandy beach of true affordability. Which brings us to April, and 50-year low interest rates. 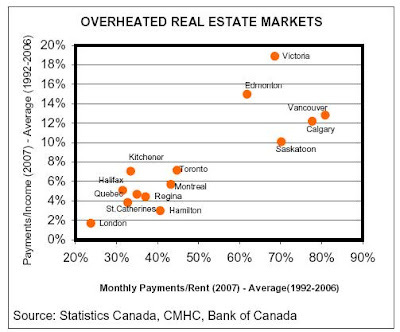 And the myth of affordability. As if average homes selling for 7.8 times average yearly incomes somehow creates a new benchmark of affordability when the historical trend has been 4 times income. Difference between now and 10 months ago: $960/month. If you've been watching the market for any length of time, or have done some digging into how this whole mess got started in the first place, you'll recognize that the ingredients today are very similar to 2002. In 2002, we were just getting over the dot com collapse and the 9/11 effects. The world's money elite, in their infinite wisdom, spurred a buying frenzy in real estate with artificially low interest rates. Get out and shop. Consumers are the savior! In 2009, in the beginning stages of a global economic event not seen since the Great Depression, caused by an addiction to debt, the world's money elite, in their infinite wisdom, spurred a local buying frenzy in real estate with artificially low interest rates. 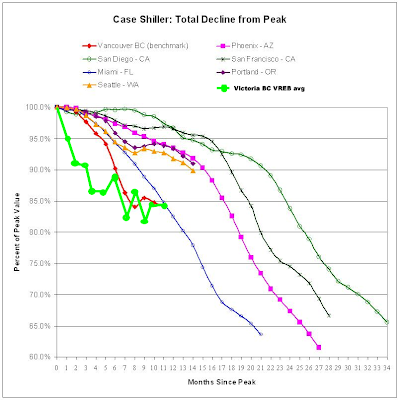 Remember that affordability issues, caused by high home prices, caused the local market to correct. 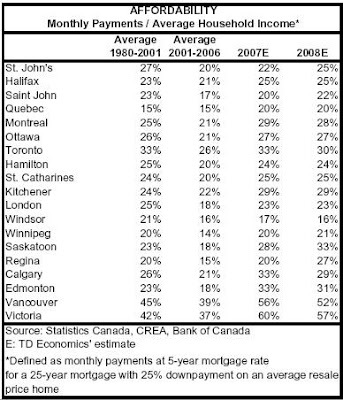 A 15% correction thus far still left Victoria 18% over-valued according to TD Economics research. Buyers buying on monthly payments alone, often in places they don't plan to stay in for longer than a few years, are propping up the bottom of the market. Everything else is languishing unsold. Few people think now is a good time to sell, so they are waiting to list their properties. Interest rates can only go up--causing the fog of affordability to be pierced by the true blinding light: falling prices. Reid has an excellent predictive graph on the effects of interest rate changes on median single family home prices in Victoria. The BoC has taken the unprecedented step of telling us interest rates will remain unchanged until late 2010. Will prices drop further between now and then, or will the monthly payment addicted True Real Estate Believers™ continue to prop up the Victoria market? Twenty years ago this month, I bought my first house. Like most FTB’s I went to the bank and asked how much money they would lend me, negotiated the best five year mortgage rate and went out and bought a house that matched up with the maximum amount the bank offered me. Back in 1989 the discounted five year mortgage rate was 11.25%. Today the best five year rate is 3.69%. Back in 1989 I could only extend my amortization period out 25 years whereas today I can go out 35 years. So I started thinking that most of these FTB’s today are likely doing the same thing I did. They go to the bank and are told how much they can borrow. But today because of changes to both interest rates and amortization periods, the amount one can borrow has increased substantially. The chart below illustrates this. So today someone with 10% down can easily buy a home worth six times their income whereas back in 1989 you were limited to about 2.5 times your income. 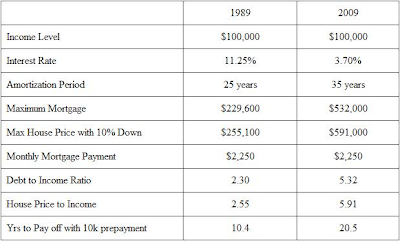 If the 1989 family was able to save 10% of their income ($10k per year) and apply this annually to the mortgage, they could pay off their mortgage in just over ten years, but it will take over 20 years for the 2009 family to pay off their home. If the first family after paying off their mortgage continued to contribute the same amount into a retirement fund earning only 5%, they would have over $475,000 saved in the ten years while the former family was still paying off their mortgage. This whole thing got me thinking that maybe we can explain most of the housing bubble through mortgage lending changes, so I pulled together an analysis of average income levels in 1989, 1999 and 2009 with mortgage lending practices and average house prices to see if there was a correlation. Results are shown below. Amazingly the increase in SFH prices over the past twenty years is highly correlated to the maximum mortgage being made available to average families. This analysis aligns with what the greatest real estate investor I know once told me which was always to buy real estate when interest rates are at their highest levels because prices will always be lower. Today many people that could not have qualified for a SFH because of their income levels, now can with these ridiculously low interest rates. This has increased the pool of buyers and resulted in a mini sales boom for entry level homes. It appears to be almost predictable. Smart money will wait for interest rates to rise as this will both decrease the number of buyers in the market while simultaneously putting pressure on people renewing their mortgages at higher rates as others have well documented on this blog. Looks like I plan to become a FoRenter as this is what smart people are doing. In the US, mortgage resets are partly responsible for the financial mess that is wreaking havoc throughout the global economy. In Canada, and Victoria specifically, mortgage resets haven't been a significant issue yet because interest rates haven't fluctuated outside of a two to three percent zone over the past 6 years. We are witnessing an unprecedented period of extremely high prices and extremely low interest rates. While home buyers today are out loading up on overpriced homes at incredibly low interest rates with little to no forethought about what this might do to them financially in five year's time, readers of HHV get to see what it may look like. If you bought the average home today, using a 5% down, 35 year amortization mortgage, locked in for 5 years at 3.69%, you'd be taking on about $500,000 in debt. This debt will actually cost you more like $1.15 million by the time you're finished paying it off, but that's a whole other issue. What concerns me most, is what this level of debt looks like in five year's time. Let's make one key assumption here that is backed up by 31 years of Victoria real estate history: the price of your home will not have appreciated at all in this next five year period. How many families buying today do you know that could handle a jump in monthly payment of anywhere between $600 and $1200 per month? I don't know any. And if this happens, many of these families will be forced to sell their homes. With $38K in equity, they have few options. REALTOR fees will eat half of that $38K. The market won't be "booming" in an interest rate environment like that, that's for sure, especially if prices have remained high. Wages haven't kept up, neither have rents. It could be a dangerous recipe. I believe, as do many of the readers here, that we're going to see prices drop another 15% or so over the next several years. If we're right, then the scenario above is really dire as some lenders won't renew mortgages on underwater properties and homeowners may face cash calls. Are we going to see an increase in distressed sales in five year's time because of extremely high prices and low interest rates today? Does it make sense to wait to save potentially save $100K? What numbers are you using in your calculations? The real estate industry wants you to believe you can't time the real estate market. You can. It's incredibly easy and they give you all the information you need to do it, for free! Consider it a public service from people who care. 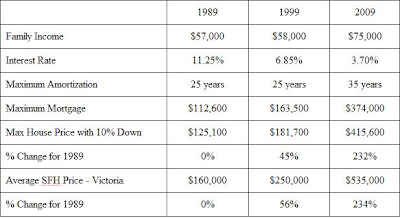 Here's the most important thing you need to know about real estate history in Victoria: it repeats itself. If you've been talking to anyone involved in the business, you've no doubt heard "Victoria real estate always goes up" or "Victoria real estate doubles every ten years" or "it's time in the market not timing the market." All three statements take advantage of an ethical gray area the real estate industry continues to exploit. None of them are really true but neither are any of those statements outright lies. But no one involved in selling anything to do with real estate should be allowed to utter them without having to also make a mandatory disclosure, like the one a mutual fund salesperson has to make when they talk about the financial performance of one of their products: you know the one that says past performance doesn't guarantee future performance and all that. Anyway, I digress, and the industry will just regress to "we're selling homes, not investments" if we try to debate this point any further. Did you know that when those ships you see off Victoria's waterfront go by, they are already slowing down and planning their turns to get into Vancouver's ports? Ships that size have huge momentum. It takes a lot of power to get them up to speed and it takes a lot of distance to slow them down. If you've spent any time on the water, you know to look for the signs of movement in these ships so you can avoid them. And it's the same thing with the real estate market, except your motivation is different: look for the signs of momentum so you can exploit them. Given that interest rates basically double your purchase price, waiting to save 15%, is really like saving 30% over the lifetime of a mortgage. Sounds good to me. Of course, past performance doesn't guarantee future performance. But I'm willing to bet, for the near future at least, that this correction will be exactly like the past corrections, or maybe a bit worse, only because the global economy seems a bit more strung out on the housing crack than it has, well, ever. New housing was largely absorbed, but too many households bought in and this will drag down demand for additional building in the years to come. Over the long-term, the value of housing cannot exceed what households are able and willing to pay to live somewhere. House prices are necessarily tied to incomes. the long-run. We project that the average house price will fall by approximately 15% relative to its current level over the course of 2009. Emphasis mine. A projection of 15% more drop, on top of the 10% plus we've already experienced from the April 2008 peak. That's likely a conservative projection. It's a long and thorough read, and I suggest you do read it, especially the rental equivalency section. All in all, it's a very well balanced analysis from a bank with a good track record of having stayed out of the muck. UPDATE: Roger continues to out do the big 5 economists with his no-spin graphic statistics analysis. Big time thank you Roger. My personal favourite: She's a hot market, if you don't compare her to anything we've seen since 1999. The VREB has been trying to spin to the public that we are currently experiencing a balanced real estate market. Statistics I have been collecting indicated that there are actually two distinct markets in Victoria; a strong seller's market below $650k, especially in the more desirable locations and the strong buyer's markets in all regions above $650k and especially above $800k. 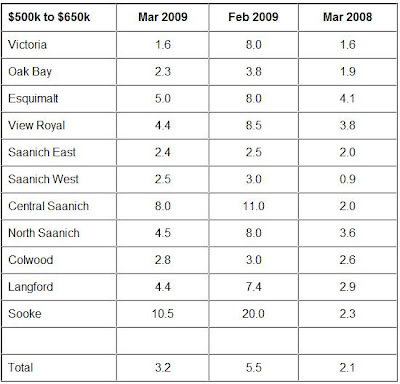 Below is a summary of MOI (months of inventory) statistics for SFH’s in Victoria using March sales numbers and MLS inventory from March 30 2009. 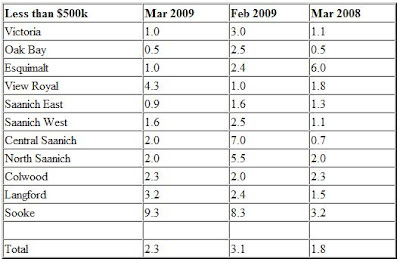 I have also provided a comparison to February 2009 and March 2008 (using quarterly data given lower sales volumes). My sales breakdown by price is estimated using medium and averages but any errors in this will not be material enough to distort the overall trends shown. In March 2009, the statistics showed that sales for SFH’s under $500k were actually UP about 10% across Victoria. 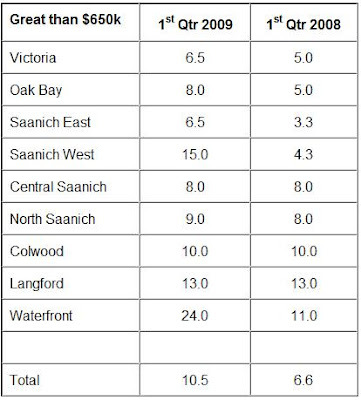 But if you just look at Victoria, Oak Bay and Saanich East which contain the more desirable places to live, sales in March 2009 were UP over 50% from March 2008. Now today you may get a slightly better house for $500k than last year, but a 50%+ increase is truly amazing given we are facing the worst recession since WWII and last year this time we were still in the greatest real estate bubble of modern time and few people were concerned about losing their job. The current MOI data for Victoria, Esquimalt, Oak Bay and Saanich East are at or under 1.0. This would indicate a very strong seller's market. Combine this with much higher sales in these regions; new listings that are priced right are obviously selling, which is likely why we are not seeing inventory levels increase at the lower prices. 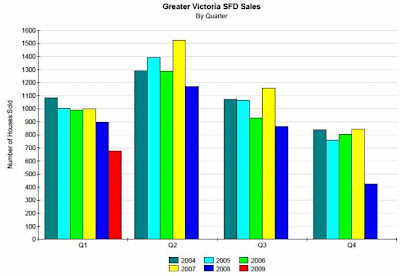 In contrast, above $650k, each area of Victoria has seen sales volumes drop between March 2008 and March 2009 while MOI numbers have increased. Last year on average it was a buyer's market, but a balanced market in the more desirable areas. Today we are seeing a buyer's market in all regions of the city at the higher price levels. 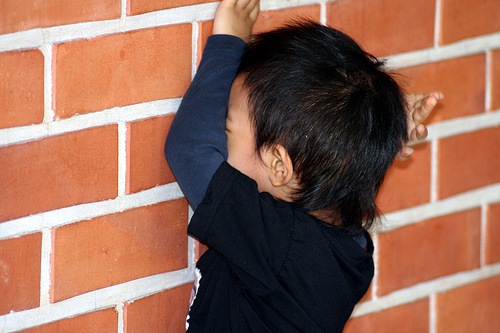 Once you get above $800k, things get really ugly (from a seller’s perspective) everywhere. So today you do not appear to have a balanced market anywhere as the VREB suggests, but rather a unique dichotomy where you have a very strong seller's market at the low end in the desirable locations and strong buyer's market at the higher end. How long can this dichotomy last? Will the higher priced home sellers drop pricing and push down the market? Do these mid to high priced sellers hang onto their price expectations as they see how hot the low end of the market is? Given what I see in these statistics I am not overly optimistic we are going to see prices of the lower priced homes dropping soon. I know that my wife and I are in a wait and see pattern and based on what happens we will go after amore expensive property or look to buying elsewhere in the province. A total of 602 homes and other properties sold in March through the Victoria Real Estate Board’s Multiple Listing Service® (MLS®) up a significant 49 per cent from the 403 sales in February. There were 707 sales in March of last year. Prices, meantime, remained very stable with modest increases in some sectors. There were 3,859 properties available for sale at the end of March. That represents a seven per cent increase compared to March of last year and only a minor increase from the 3,844properties available for sale at the end of February. Markham noted that prices remained strong and stable in March. The average price for single family homes sold in Greater Victoria last month was $534,689 down slightly from $542,396 in February. However, the median price rose to $503,751. The six-month average was $540,244. The overall average price for condominiums was $294,393 last month up from $286,985 in February. The average for the last six months was $288,661. The median price for condominiums also rose in March to $266,500. The average price of all townhomes sold last month was $405,003 up from $381,383 in February. The six month average was $398,320 while the median price in March was $356,450. MLS® sales last month included 343 single family homes, 163 condominiums, 64 townhomes and 11 manufactured homes. TC analysis is out and it's surprisingly balanced. The market is being completely driven by access to cheap credit. We're seeing the same effects we did in 2002-03 and in 2006 when interest rates were lowered, down payments were eliminated and amortization was hyper-extended. I strongly believe that it is FTBers who are providing the floor. And I strongly believe that they are doing so without a single thought outside of buying at all costs. There is no long term view happening in our market right now, IMHO. Despite this buying effect, prices are not climbing. This simple fact should be a cause for concern to the market. Houses, especially with suites, priced at $550,000 or less are still firmly in seller's market territory in Victoria. And prices aren't going up because that price point is at the extreme limits of mortgage helper supported mortgage payment affordability. When prices in this segment don't rise, the move-up market disappears, albeit slowly. I'm still "seeing" a flat market until June, then a steady downwards pressure on prices for the rest of the year. The days of increased prices in Victoria are gone. And they could be gone for a long time, even up to 10 years. Right now the market is fighting itself: will prices drop drastically, or will they flat-line for a decade until they get back to the inflation trend line?